Living in the moment is easier said than done. 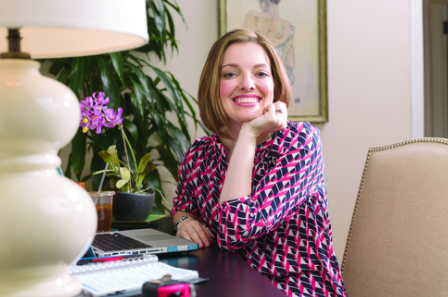 As a gal who is never far from her planner and to-do lists,Betsy has lots of questions for carpe diem expert, Jasmine Brett Stringer. Change your shower curtain and change your life in this episode! The emails have been pouring in so quickly that Betsy can't keep up. You have questions and she wants to get you answers in a timely manner. In order to squeeze in as many responses as possible, here is another Q&A dense episode. Not sure to do with Tuscan tile? Feeling unclear about what industrial style really means? Afraid to commit to your rental? Betsy gets real this episode with advice for these dilemmas and more! Wanna add some spice to your kitchen and relationship? Shani Delamor of AppetiteforSeduction.com joins Betsy in the studio to talk about her favorite dinnerware, kitchen gadgets, and food fantasies. Marie Kondo's organizing method isn't working for me or my clients. In this episode, professional organizer AnnaBauer of SortedByAnna.com shares her strategies for take the shame out of being a little bit messy.